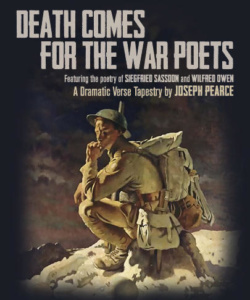 Who knew that a play with such a solemn title, Death Comes for the War Poets would reverberate on such varying planes of emotionality and thought? Quite the heady script written by Joseph Pearce, centering around the poetry of Siegfried Sassoon (1886-1967), a soldier who fought bravely in WWI, received the Military Cross for bravery, but who also stood up and voiced his dissent with the British government for their handling of the War and the men that gave their lives. The use of Sassoon’s (Nicholas Carriere) own prose adds weight to an already heavy topic, with additional text from other voices of the modern era; T.S. Eliot, G.K. Chesterton, as well as Wilfred Owen (1893-1918). By his side in outcry, is Owen (Michael Raver) himself, a friend, fellow poet, and decorated soldier sharing his own take on the devastation of World War I. On a much more disturbing stance, Death is ever present, standing over Sassoon, in traditional hooded black cape. Knowing this, I must admit, I was not all that excited as I entered the theatre at the Sheen Center on a beautiful summer’s evening in the East Village. 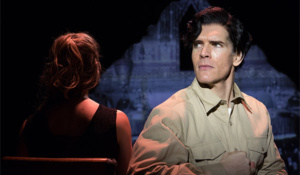 A play about War, Death, English poets all in prose filled me with a certain type of theatrical dread (click here for another prose-filled play review). And seeing Death arrive in that traditional garb hovering over Sassoon made my heart sunk a wee bit. Against a stunning background of a white church wall with projections of darkness and fog (beautiful design work by scenic designer, Connor W. Munion; lighting designer, Michael Abrams; and projection designer, Joey Moro), I thought to myself that this was going to be one heavy dark piece of theatre. Then, much to my surprise, Death, played with exciting musicality and sprightliness by Sarah Naughton (Roundabout Underground’s Diamond Alice), transformed. Flinging herself quite dramatically into a whole other interpretation of what Death is and means. And it didn’t stop with that one provocative shift (subtle and solid costumes by Jennifer Pacheco). Writer Pearce and director Peter Dobbins (The Storm Theatre’s Deconstruction) kept expanding and redefining as we watched Sassoon’s own expansion of mind and spirit. Death became something else before our eyes as Sassoon embraced a new pathway to understanding. Such relief, that this 70 minute play never just sat in its heaviness but danced and sang its way through the poetry of War and Death, never hitting us over the head with a dark melancholy. Ever surprising us with hope, love, and spectacularly beautiful imagery. 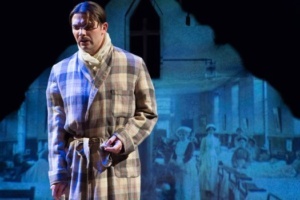 Much of this has to do with the fine directorial choices made by Dobbins, and the spirited performances by both Carriere (Guthrie Theater’s A Midsummer Night’s Dream) and Raver (The Pearl’s Vieux Carre). They brought life and dimension into their character’s tragedy and pain. Their confusion and desire to understand why such a horrific tragedy would or even could come to pass was as engaging and thoughtful as could be, way beyond the imagined concept that I was prepared for going in. Although I am neither a scholar nor a poetry-master, especially in the works of these two great writers, there was beauty in their misery and Sassoon’s final acceptance and embrace of his spirituality. Much of the language and poetry went over my head, as I noticed others laughing and nodding their heads in understanding and appreciation, but the overall themes and imagery of larks singing and guns a blazing were impossible to not take in. This is a piece filled with tremendous heart and earnestness. Not exactly what I had in mind on a lovely summer’s night, but as far as verse drama goes, Death Comes for the War Poets was an uplifting experience as we travel alongside Sassoon’s quest to make sense of his life, and life itself.